David Maguire of ESRI Inc. gave a run through of the current beta release of ArcGIS Explorer at the Spatial Literacy in Teaching Day held at the Royal Geographical Society, London. After Googles success with Google Earth the development of ArcGIS Explorer was inevitable but the interest is in how ESRI is distancing itself from the Google Market towards the professional GIS community. This is not a surprise in itself but by moving towards spatial analysis over the web it paves the way for opening up the world of GIS analysis to the masses. There are a number of notable features in ArcGIS Explorer, firstly the inclusion of over 700 analysis models allowing queries relating to, for example, view sheds to be run within the system. While this is a no brainier for users of the Arc Desktop line of software it is an eye opener when you realise that you can put this on every desktop of every local authority. For a world of GIS which has been until now limited to people coming out of MSc courses it is moving towards opening up GIS for all and sundry, a change which could have a dramatic impact on the use of GIS in general. Secondly a feature that we thought we would of seen in Google Earth by now is Facade Mapping. ArcGlobe already has close integration with systems such as 3DMax and SketchUp allowing textures to be pasted onto buildings, increasing the level of realism in 3D city models. The integration of this into ArcGIS Explorer is of interest to not maybe the GIS community but more towards architects and urban planners – it certainly has us excited. As an interesting side note a view was made on Microsoft’s Virtual Earth which was likened to a ‘Destroyer sucking up vast amounts of data’. 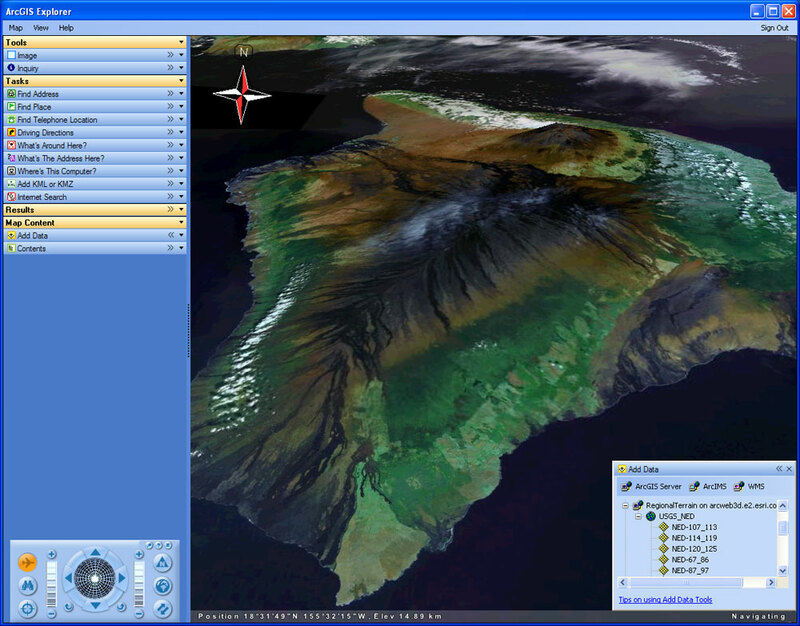 Google Earths current status was compared to the popularity of the now almost defunct Netscape Navigator which was quickly surpassed by Microsoft Explorer. Time will tell what will happen when the three Digital Earths from the main players are in the market place, but with the systems free to download and use it is an interesting time in the world of Distributed Digital Environments. Spatial Literacy in Teaching (Splint) Centre of Excellence in Teaching and Learning (CETL),is a joint initiative led by the Centre for Advanced Spatial Analysis at University College London, the University of Leicester and the University of Nottingham. SketchUp 7.1 for Architectural Visualization – Three Copies to Give Away! Good to know what is up with Arc Explorer Andy. Do you know if it will except KML/KMZ files? Or are we going to have to *trash* all of those files for yet another protocol. ESRI would really get alot more attention if all the existing KML files would work in Arc Explorer. Arc Explorer has import KML/KMZ as a key part in the Interface so yes its supported. Its not known if it will support the Network Link function but a emphasis was made on the importance of Network Sharing so I’m assuming it will. AE is an interesting tool, but don’t dump your GE mashups yet. The tester community has been challenged by the first AE beta – blue screens and no answer from data servers. The first viable AE version might not appear until August . . . It loads KMZ’s but doesn’t seem to display them correctly. The KMZ Export from RockWork’s look fine in GE but are corrupted in Explorer. Perhaps the limits for the embedded Collada files are smaller than GE’s. KMZ is supported but my GE KMZ’s (exported from RockWork’s) are corrupted. It may be that AE doesn’t support as large an amount of Collda data as GE. One thing about Google earth is its security! We thought of using gogle earth in office but decided not to after much consideration. We are trying to incorporate scriptings into Arc Explorer, which I feel is okay too!